The fantastic journey of a megila to a new Jewish museum in Germany. When my mother, Ann Hofman, passed away, one of the treasures I inherited was a Megilat Esther that was always known in the family as the “Niederstetten megila” because my maternal grandmother, Bertha Straus Hamburger, came from Niederstetten, Germany. While I never saw it used when I was a child, I knew it was a family treasure. Several years after my mother passed away, I brought it to Jerusalem and, hoping I had a valuable artifact, opened it in the presence of scholar Avraham Frank, a dear friend. It was extremely old and unfortunately pasul, unusable for ritual purposes. I was disappointed and put it on the shelf in our Jerusalem home, and forgot about it. Frank spent many hours with me talking about the German communities and individuals he had met on his 40-plus trips as a representative of Israeli organizations. He was sent to small towns to assess and examine the remnants of destroyed Jewish communities as part of the documentation in Holocaust memorial books at Yad Vashem and other institutions. 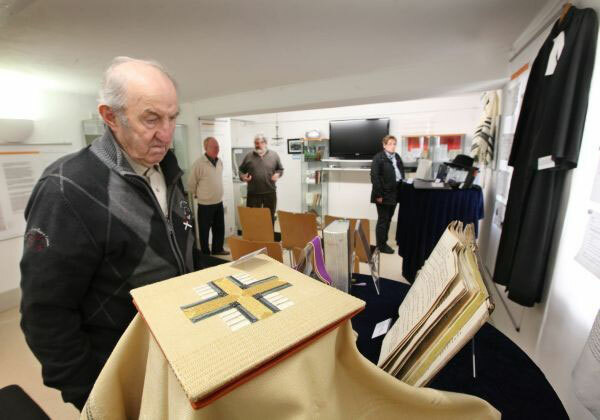 Over the years, he met German Christians who were committed to learning about and helping to restore remnants of Jewish presence such as cemeteries, synagogues and mikvaot (ritual baths). Many of these individuals also traveled to Israel, and Frank has formed relationships with many of them. 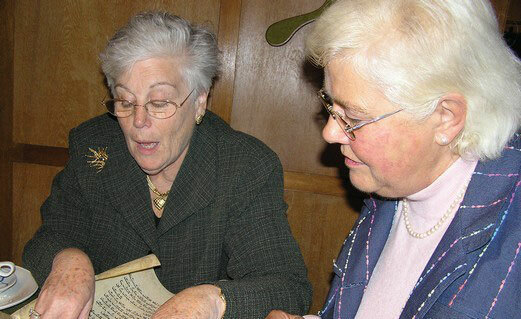 One such person, Barbara Schedler, had told him about a town, Braunsbach, that was establishing a Jewish museum and was looking for artifacts representative of Jewish life. He suggested that I consider loaning the megila to this new museum. My immediate reaction was no. Why should I let this piece of family history go back when it was one of only a few family treasures they were able to take with them as they fled Germany? Frank asked whether he could give my name and contact information to this person, and perhaps she could discuss the project with me. Shortly thereafter, there was a message on our answering machine from a woman in Germany regarding the megila. I did not return the call, and a few weeks later there was another call. I wrote to Frank, who was aware of the calls and my non-response. He suggested I reconsider and speak to the woman. After a great deal of thought, I realized that I could do more good lending it to this new museum than letting it sit on the shelf where it would go unnoticed. Upon my return to Jerusalem, I gave Frank the megila and asked him to arrange for its transfer to Braunsbach. Soon afterward, I received an email from Elisabeth Quirbach, the driving force behind the establishment of the Jewish Museum. She had received the information about the megila from Schedler. Quirbach and her husband, who had retired to Braunsbach and become active there, had heard that the town was going to tear down a building that had once been the Jewish school; since the synagogue had been turned into a community center, town leaders felt there was no need for another “Jewish building.” However, Quirbach, a theologian and teacher, found this unacceptable and was determined to see the building restored and the museum established. She had received the megila and wanted to have as much information about it as I could provide. I gave her the names of my maternal grandparents and great-grandparents. In fact, my husband, Otto, and I had been to Niederstetten in 1987 to visit our roots, and on that trip we went to seven Jewish cemeteries throughout Germany where we had family buried. I had been to Niederstetten to visit the graves of my maternal great-grandparents. My mother had an album and a locket containing pictures of her grandparents, and I of course had pictures of my grandmother (I called her Oma) and my mother. I scanned and sent them to Quirbach. She was appreciative and wanted to know if there was any chance I could come to Braunsbach. I told her that we we would be coming to Germany for the 70th anniversary of Kristallnacht, and that if she would like to meet me, perhaps she could come to Bad Windsheim, the town Otto was from. On November 10, 2008, she and her husband, Hans Schulz, came to Windsheim and brought the megila along. We sat down, and I opened it up and read parts of the first chapter to them. I told them the story of Purim and why it was called Megilat Esther, and about the various characters in the story and their importance. She took copious notes and wanted additional information about my grandmother’s family. I had brought copies of my maternal great-grandmother’s death certificate, which I had obtained when Otto and I were in Niederstetten in 1987, as well as copies of my Oma’s birth certificate and family registration from the city hall. Germans are very good about keeping records, and unbeknownst to me, Quirbach had begun doing serious work on the Jewish community of Braunsbach in the city’s archives. As she left, I was a little more comfortable about loaning my family megila to Braunsbach, since it was clear to me that this was a serious project by people who wanted to teach the local youth the history of a people that had once been a significant part of the town’s culture and life but had been annihilated. Several months later, I received an email from Quirbach, asking whether I would attend the opening of the Rabbinats Museum Braunsbach in April 2009. I told her I was unable to attend the event, but that Otto and I were planning a trip to Strasbourg on our way back to New York in November 2009 and would try to come to Braunsbach. When we arrived in November, Quirbach and her husband greeted us warmly and immediately took us to the local tavern lodge for lunch. They knew we would only eat cold dairy and salads and had already arranged a lovely lunch with the hotelier. After lunch, we began our walk around the town, where we were shown a house that had the inset of a mezuza on the doorpost. Another house had the name of a Jewish family on the archway of the door, and another had been the home of the rabbi. Along the way, the mayor greeted us, and we were escorted to the cultural meeting hall that had been the synagogue and that bore a plaque to that effect. From there we went to the museum, and as we walked in the building, we saw a mannequin of a rabbi in full garb as was the custom in 1834-1840. Quirbach then escorted us into the next room, where the megila was beautifully displayed in a showcase with the pictures of myself, my mother, my grandmother and my great-grandparents. A reporter from the local newspaper joined us as Quirbach showed us the museum. At that point, she handed me a booklet that she had prepared with additional family history she had found in the archives. Quirbach had uncovered a direct connection that I never knew my family had with Braunsbach: My great grandfather, Moritz Straus, had a brother, Jakob Bar Straus, who had been the Jewish teacher in the town from 1900 to 1920. I was standing in the room in which he had taught all of Braunsbach’s Jewish children. Quirbach had found all sorts of newspaper articles, and birth and death certificates for Jakob, his parents and his siblings, including my great-grandfather. She even had a picture of the gravestone in Crailsheim where Jakob and his wife are buried, with a date of December 23, 1923. I was in total shock. I had never known the name of my great-grandfather’s brother, nor that he was a Jewish teacher. I vaguely remembered that my grandmother had a nephew in Chicago, but had not known that he was the child of Jakob and his wife, Babette, who was born in Braunsbach. My family had gone to great lengths and made sacrifices to give me a Jewish education and to encourage my studies. I always knew of my father’s love of Jewish education and his own studies, but never knew that I had such a connection on my mother’s side. My 40-plus years in that field were influenced by role models on both sides of my family – something I now know thanks to the journey of this megila. The writer is a retired Jewish educator who has worked for the Conservative Movement’s Ramah camps, JTS Prozdor and Solomon Schechter Schools. She resides in New York and Jerusalem. Her parents arrived in Jerusalem in 1935. "Berufen und bestellt" heißt eine Sonderausstellung im Rabbinatsmuseum Braunsbach. In der Schau werden Geistliche der Region vorgestellt, die dem Judentum, dem Christentum oder dem Islam angehören. Der Andrang bei der Vernissage am Sonntag war so groß, dass die Stühle nicht reichten. Allerdings muss gesagt werden, dass die Räume im Museum nicht eben groß sind: Das Rabbinat ist in einem typischen Braunsbacher Bürgerhaus. Die Vorsitzende des Vereins Elisabeth Quirbach sagte in ihrer Eröffnungsrede, dass es zum Programm des Rabbinatsmuseums gehöre, die Pluralität religiöser Überzeugungen aufzuzeigen. Deshalb informiert die aktuelle Sonderausstellung über jüdische Rabbiner, christliche Pfarrer und muslimische Imame. Neben zahlreichen Infotafeln sind Exponate wie Gebetsbücher und Amtsroben der verschiedenen Religionen zu sehen. Beeindruckend ist, wie akribisch und liebevoll die Verantwortlichen das Thema aufarbeiten. Das Highlight der Ausstellungseröffnung boten jedoch drei Videointerviews, in denen aktive Würdenträger über ihre Tätigkeit berichten. Nathanel Wurmser ist seit 2002 Landesrabbiner in Baden-Württemberg. Er hat seinen Amtssitz in Stuttgart, dort befindet sich auch eine Synagoge. Wurmser ist verheiratet und hat acht Kinder. Zur Berufskleidung gehört eine Kopfbedeckung, meist trägt er einen breitrandigen Hut. Mit seinem grauen Vollbart entspricht er der Vorstellung, die man von einem Rabbiner hat. Wurmser, der in der Schweiz geboren wurde, studierte in Israel. Er erinnert sich gerne an die Zeit, denn "er neige zum Studieren". Als Landesrabbiner ist er für alle jüdischen Mitbürger im Land von der Wiege bis zur Bahre zuständig. Der Einfluss auf die Familie des Landesrabbiners ist sehr groß, die Ehefrau und die Kinder müssen die Aufgabe mittragen. Ganz anders präsentiert sich der junge evangelische Pfarrer von Bubenorbis und Geißelhardt Tobias Rößler. Er ist 34 Jahre alt, verheiratet und hat drei Kinder. Humorvoll berichtet er, dass das Händeschütteln eine typische Handbewegung seines Berufsstandes sei. Als geschäftsführender Pfarrer komme schnell eine Wochenarbeitszeit von 55 bis 60 Stunden zusammen, knapp 40 Prozent davon seien mit Papierkram gefüllt. Mit seinem Gehalt kann der Pfarrer die Familie versorgen, der Kopf bleibe frei für die Aufgaben in der Gemeinde. Rößler hat oft das Gefühl, dass der Beruf kein Ende habe, das berufliche Umfeld sei ja immer da, die Gedanken kann er nicht abschalten. Musa Abdurahmanoglu ist seit September Imam in der Haller Mevlana-Moschee. Er ist verheiratet und hat zwei Kinder. Derzeit lernt er am Haller Goethe Institut deutsch. Der Imam bleibt für fünf Jahre in Schwäbisch Hall. Als Beamter bekommt er sein Gehalt vom türkischen Staat. Wegen der vielen Verpflichtungen und einer Sieben-Tage-Woche hat der Imam wenig Zeit für seine Familie. Da seine Frau auch Theologie studiert hat, können sie Aufgaben teilen, zum Beispiel Religionsunterricht geben. Ungefähr 50 Prozent der Gemeindeglieder kommen zum Freitagsgebet in die Moschee, der Zusammenhalt ist sehr stark; das hat sich auch beim Bau der Moschee gezeigt. Durch das Gegenüberstellen der drei Berufsbilder entstanden hochinteressante Eindrücke. Zu weiteren Informationen bietet sich ein Besuch der Ausstellung an.